They are called Pocket Discs. 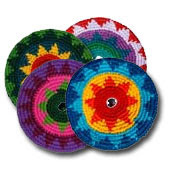 Little frisbee-type discs that are basically crocheted, they don’t hurt if they hit you, are waaaay easier to catch, and soar through the air with ease! You can even play with these indoors. They are SO FUN. How many games of frisbee have been stopped cold when someone gets a hard disc to the face or ends up with a bloody lip? Won’t happen with this amazing invention! We have played with ours in the house, out in the yard, in the pool and when we went camping. Fair warning though, don’t play with them in a lake as they will sink and you will lose it. Then you’ll be really upset that your kids just lost the best family toy of the year. Luckily, my 11 year old was persistent and ended up finding it, yay! “Savanna Groft, a third grader at the time, was assigned a project at school. Her teacher asked her to crochet a round placemat as part of her handwork studies. Savanna’s initial efforts yielded a round disk, but because she had not added enough stitches, the disc curled under forming a small lip. This placemat of sorts sat on a table in her living room until Savanna’s friends, Hannah and Ellie came over to visit. On a whim, Hannah and Ellie’s dad, Chris, picked up the disc and threw it. It sailed across the living room and the Pocket Disc was born.” How fun is that? Check out their site to see all the cool designs, watch videos, read testimonies, and for a chance to win one of your own! Even if you enter, you should buy one right away. These rock and they are only $9.99! Go. Now!